View of “MM – Mundus Muliebris,” 2016. MM (for mundus muliebris, or trousseau) is the acronym for a brand conceived for this occasion, an experiment curated by Nicoletta Lambertucci that relates the worlds of art and fashion. The spaces of Basement Roma have been transformed into a laboratory of sorts, where clothing, furnishings, and accessories absorb the uniqueness of art, playfully taking its place. Viewers are welcomed by a multicolored environment that itself becomes a site of creation as well as an unusual showroom. 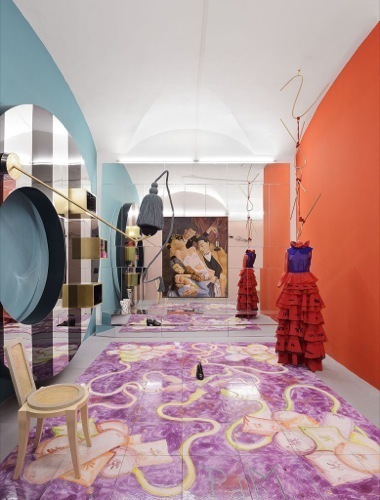 Two mirror-image rooms by Patrizio di Massimo face and refer to each other: One features a majolica floor and a green backdrop with drawn images of cushions and wavering ropes (Inductive Deductive [Mundus Muliebris], 2016); the other has a similar floor but a purple backdrop (Deductive Inductive [Mundus Muliebris], 2016). Both offer scenes that evoke a theatrical production in several acts. A collaborative project by Than Hussein Clarkand Marini Calzature—an imagined bespoke shoe manufacturer, established in 1899––comprises reproductions of shoes worn by Valentino and Renato Balestra, memorable rivals in fashion and taste whose polar presence extends outward like the ripples of a stone dropped into a pond. In an installation dedicated to Tennessee Williams, three women’s gowns by Hussein Clark, created in collaboration with G.A.N. (Federica Ducoli and Gaia Fredella), establishes a dialogue with a mannequin/suit/sculpture by George Henry Longly (Untitled, 2016) that uses trousers by Fabio Quaranta to allude to a male presence. Di Massimo reworks the decorative motifs for fashion designer Benedetta Bruzziches’s “Carmen” purse with a gilded miniature hand-shaped clasp. And the mirrored surfaces and geometries of another work by Hussein Clark—comprising a display unit and chairs—wink at 1970s aesthetics. The installation catapults the viewer into a kaleidoscopic universe where objects become works and creativity transcends functionality.